On Good Chef, Bad Kitchen , professionals take on the ultimate challenge: Cooking in a bare, under-utilized kitchen. 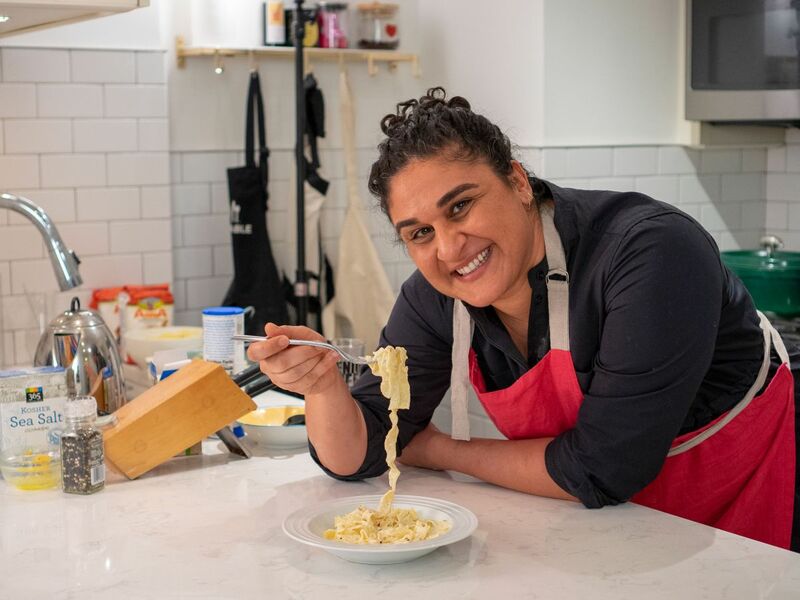 In this episode, Salt, Fat, Acid, Heat’s Samin Nosrat makes pasta from scratch — and a killer bowl of fettuccine alfredo. 3. Use your fingers to mix the dough; if you need it, add another egg yolk, a tablespoon of water, or some egg white to help bring it all together. Once it comes together in a ball of dough, like playdough, remove it from the bowl and knead for 4 to 5 more minutes, until it’s smooth and uniform. 4. Wrap in plastic wrap and let sit for at least 5 to 10 minutes if you’re using “00” flour, or 30 minutes, up to 4 hours at room temperature if you’re using all-purpose flour. 5. After resting, prepare to roll out your dough. Using a rolling pin, or a carefully wielded bottle of wine, roll it out into an inch-thick or so, then fold into thirds and repeat. This is an “extended kneading” process. Then set aside and let rest under a damp towel for another 10 minutes or so. 6. For the final rolling, treat the dough like pie crust and roll outwards from the center, and turning a quarter ever so often in order to get the dough as thin and even as possible. 7. Once you’re almost at your desired thickness, cut the pasta dough to fit your rolling pin. Then, heavily flour the dough, wrap it around the rolling pin or wine bottle, and press down and outwards in order to further stretch the dough. 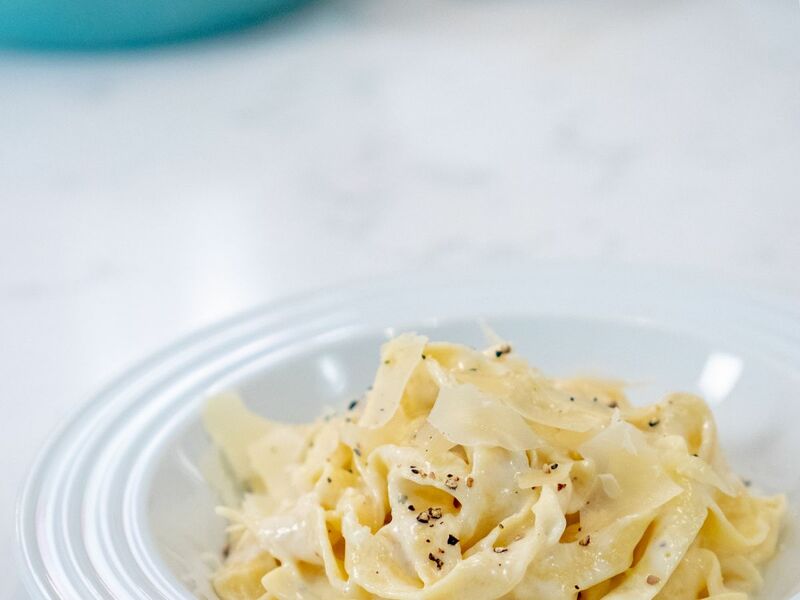 Once the pasta sheet is thin enough to see the outline of your hand through it, it should be ready to go. 3. In a large skillet, melt 3 tablespoons of butter and add your minced garlic. Cook gently over low heat until the garlic is softened, before it takes on any color. Add the garlic to the reduced cream.